Saturday morning, 1:22 a.m. It's a weekend and one thing to look forward to aside from a lot of "me" time is the release of Tonner's new Scarlett outfit (only I hope) called "Dressed up Like Racehorses"
Thanks to Dale Ohl of Lonestar dolls (check his site out) and to Nikki who enlightened the Scarlett Vinyl Yahoo Group of what to expect. So, before retiring for the night and pardonne moi for retiring so late. It is a weekend after all, I decided to do one more portrait of Tonner's "Return to Tara" doll. She wears the Franklin Mint's very rare blue portrait gown, photoshop-ed to have a new deep red color. If one spent a lot of time waiting for this outfit and finally paying a reasonable price (than what is usually auctioned off in ebay), it pays to explore the possibilities of this gown. The draping of the gown wonderful and drapes in scale. The material is very soft velvet that flows easily with every pose. Happy collecting. The journey begins in 2010. But for now, good night everyone! Thanks for your comment Jenn! I must admit it true but really a 16" doll will never fit in a 15" dress. The only thing I love about the Tonner version is that it has rooted hair and has articulation. Wish they used the Daphne sculpt instead. 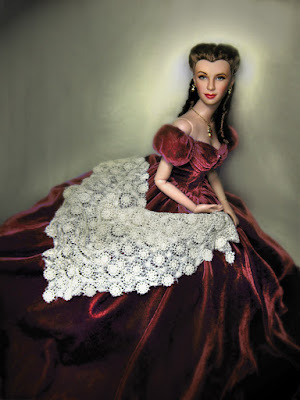 With all that, why do I buy Tonner Scarlett?Simply because I can pose her. = ) I love Franklin Mint's attention to detail very much. And how I wish those dresses could fit Tonner. Either that or wishing that Franklin Mint would consider serious articulation. Happy doll collecting Jenn. Thank you for passing by and sharing your perspective on these. Much appreciated!